What, you thought I wasn’t going to write something about the Finals? The Los Angeles Lakers host the Orlando Magic tonight in a best of seven series to determine NBA’s champion. Most experts are picking the Lakers to take the series in six or seven games, but the arrival of Jameer Nelson has given some doubts about the Lakers rolling. These five keys will be crucial in determining who stands last at the end of the series. I almost finished the question with “can someone stop him?” before realizing that it’s near impossible to stop Superman. In the playoffs, Howard is averaging 21.7 points and 15.4 rebounds and has a double-double in all but one game. What’s even scarier is that his free throw percentage is up almost ten points to 65 percent, making it less than a guarantee for him to miss one when he is fouled. Trying to stop Howard will be the combination of Pau Gasol and Andrew Bynum…good luck. Bynum has failed miserably at giving the Lakers any solid minutes while in the lineup as he has averaged just 17 minutes in the playoffs this year. He is more of a liability than a presence on offense and his defense has been less than stellar. Can Andrew Bynum stop this sight from happening? There is no room for error going up against Howard and if Gasol guards him, it will get ugly. In game six against the Cavs, Howard took over the extra period and showed no signs of slowing down. Both Gasol and Bynum will have to, in a sense, “take turns” with Howard trying to keep him away from the basket. Everyone knows Orlando’s game runs on the three point shot and Los Angeles has had trouble stopping it this year. Orlando made 12 threes in each of the games they played Los Angeles in the regular season. The Lakers, like Cleveland, defend the three point shot very well but with Howard owning the paint, double teams might be necessary. Because of that, whether or not the Lakers can close out on shooters will be huge. This goes back to Bynum and Gasol being able to stop Howard by themselves. In Orlando’s playoff wins this year, they have shot 39.2 percent from downtown, while in losses they have shot just 32 percent. While one would expect percentages to be down in losses, the gap here is bigger than usual. They shoot around the same amount of threes every game (24 in wins, 22 in losses), so it’s a matter of whether or not they go in. Odom has had such an up-and-down season but has carried on through it all. His hard work has paid off as he has been given the opportunity to play large minutes for Phil Jackson and has answered that call. All of his numbers are up in the playoffs and it seems as though the Lakers go as Odom goes. Mickael Pietrus could hold the key for the sharpshooting Magic. For Orlando, Mickael Pietrus is the reason Orlando has had so much success from beyond the arc. Pietrus is 33-84 (39 percent) in the playoffs and played about as good of defense on LeBron James as humanly possible. Coming off the bench, he will have the fun responsibility of guarding Kobe Bryant whenever he is in. For Odom, he will more than likely be guarding Hedo Turkoglu and have to play solid defense as Turkoglu can do just about everything on the court. The better performer of these two players just might determine the outcome of the series. Everyone was amazed to hear that Jameer Nelson was going to be activated to the roster for the Finals, even after Magic officials said there was no chance he would play. Now the question is what can he bring to the table? In the two regular season meetings, the would have been All-Star averaged 27.5 points for the Magic and was the best performer Orlando threw out there. However, why would you want to mess with a team that has just won the Eastern Conference and whose backcourt seems to be meshing as good as it has all year? I’m all for Nelson gutting it out and trying to play (he will not play in Game one), but how will this affect Rafer Alston’s minutes and will it also throw off his rhythym? Hopefully these questions are answered in a positive way for the Magic, but I am not as confident that this is the right move. The Magic are 7-2 at home in the playoffs and the Lakers are 8-1 at the Staples Center, so the ability to steal a win on the road will be both tough but important. With the NBA’s odd 2-3-2 format, the Magic will have a chance to take a huge advantage in the series if they can take games one or two. However, unless they go out and dominate the series in five games, they will have to win the series in Los Angeles. For the Lakers, winning games one and two would secure a return back to LA for a game six and potential game seven. The stakes are greater and games at home, especially for the Magic, will be key. Will Kobe finally win a trophy to call his own? While it’s true Mickael Pietrus did a good job guarding LeBron James, the King still went for 38 points per game and was pretty much unstoppable. 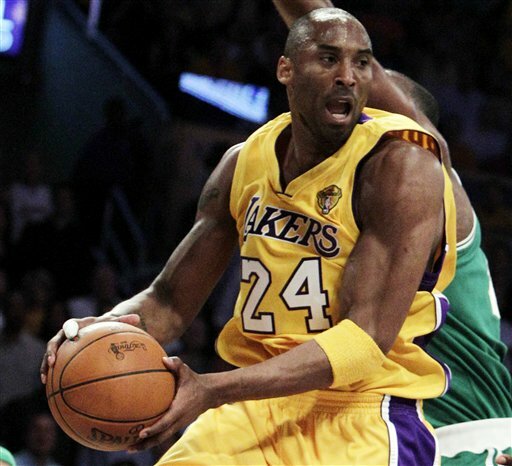 In guarding Kobe, Pietrus will have to always have a hand in his face and never let him get out of sight. Kobe is not as quick as James is in getting to the hole but has a much better jump shot. With Howard sitting in the paint, Pietrus must make Kobe beat him off the dribble and hope for a pass. As it goes for Kobe, he says he has been waiting for this moment forever. He finally has his team in the driver’s seat and he is the main part that makes the machine run. He knows what is at stake for his team and that this is his last best chance to take home a title. I have always said Kobe has never received enough credit for being such a good teammate, and he will need to rely on those teammates to beat a very balanced Magic team. Everything runs through Bryant for the Lakers and the table is set for him to take over this series. Will the Magic let him?